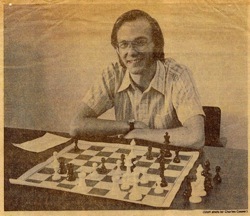 Recently Gjon Feinstein showed me a Paul Morphy game that he had recently shown to his students. Like so many of Morphy’s games, it was short and sweet. 1. e4 e5 2. c3?! (Pretty unconventional by modern standards) 2. … Nf6 3. d4 Nxe4 4. de Bc5 5. Qg4!? Position after 5. Qg4. Black to move. Here Black got too greedy, playing 5. … Nxf2? and was swiftly punished by 6. Qxg7 Rf8 7. Bg5 f6 8. ef Rxf6 9. Bxf6 Be7 10. 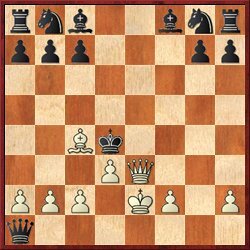 Qg8+ and Black resigned. If you’re curious, Black should have played 5. … Bxf2+! 6. Ke2 d5 7. Qxg7 Rf8, when it’s still a game. 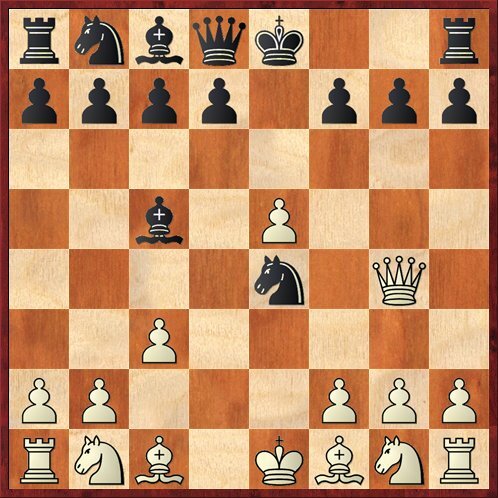 Really in the diagrammed position Black should not lose by force, because he has actually violated fewer opening precepts than White (Morphy) has. 1. e4 e5 2. Nf3 d5?! 3. Nxe4 de 4. Bc4 Qg5?! Position after 4. ... Qg5. White to move. Look familiar? It’s just our first diagram with colors reversed, and the pawn on c7 instead of c6 (which makes little to no difference). I got into ChessBase and searched for this position. It turns out that this is still a topical position that has appeared about 100 times in the database. Here 5. 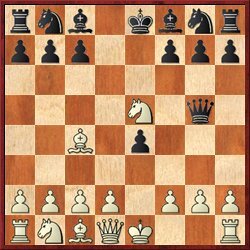 Bxf7+ is the most popular move for White but it only scores 47%. But when did this position first appear? The answer to that question came as a little surprise: It was first played in 1855, three years before the Morphy game! Not only that, the game was really more remarkable than the Morphy game. (Begin at diagram 2.) 5. Nxf7? (That’s right, Lange blundered.) Qxg2 6. Qh5! (If you’re going to go down, at least go down swinging.) Qxh1+ 7. Ke2 Qxc1? Here “NN” could have played 7. … Qf3+ 8. Qxf3 ef+9. Kxf3 Nf6 etc. 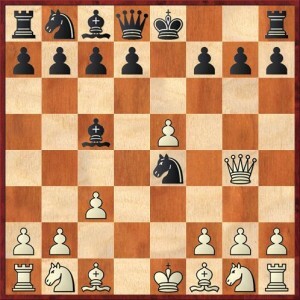 Though Black temporarily goes down a pawn, White’s knight is not likely to survive after 10. Nxh8 Bg4+ followed by … Bh5. But that’s not the way they played in the 1850s. They grabbed material and held on for dear life. The rest of the game is a massacre. Black massacres all of White’s pieces, and White massacres Black’s king. You’ve got to see the final position to believe it. Final position, Lange vs. NN. Now here’s a tantalizing historical question: Did Morphy know about this game? It’s tempting to think that he saw it, realized that NN’s idea of 4. … Qg5 was actually playable in spite of the debacle in this game, and decided to play it with colors reversed. Is it even possible that he prepared this opening for use against Max Lange? If the Internet had been around in the 1850s, the answer would almost surely be “yes.” But in that era, information moved a lot slower, so who knows? I’ll leave it as a puzzle for the historians to figure out. But I wonder if this assessment is still true. I think that the Elephant Gambit may even be playable (or “just about playable”) on the master level too. When I got on ChessBase and looked up the main lines, I saw masters all the way up to the 2500 rating level playing it and not getting punished. I wonder if it’s time to give this maligned gambit (1. e4 e5 2. Nf3 d5) a little bit more respect. Maybe it would help if we gave it a new name … something that would not sound as comical as Elephant Gambit… How about Morphy Gambit? Next post: I Can Do That, Too!